ICCO President Maxim Behar has been appointed to the Advisory Board of the Museum of public relations, was announced yesterday in New York. The Museum of Public Relations is a not for profit organisation and is the only public relations Museum in the world. It is based in New York City at CUNY Baruch College in the Newman Library Archives and Special Collections. The Advisory Board consists of top PR professionals with vast experience and significant achievement in the industry. “I really look forward to working hard to make our business, public relations, more popular and also more accessible to students and future generations,” Mr Behar himself has commented. 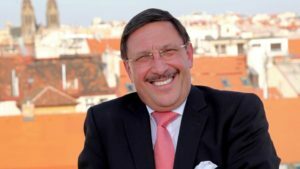 A globally recognized PR expert of Bulgarian origin, Mr Behar is the founder of the leading PR company M3 Communications Group, Inc., partner of Hill+Knowlton Srategies since 2000. In 2015 he was elected President of ICCO. He is also Honorary Consul General of the Republic of Seychelles, member of many international and local Boards. He is lecturing in Universities all over the world. The International Communications Consultancy Organisation (ICCO) is the voice of public relations consultancies around the world. The ICCO membership comprises national trade associations representing 48 countries across the globe in Europe, Africa, Asia, the Middle East, the Americas and Australia. Collectively, these associations represent some 2,500 PR firms. ICCO provides also professional trainings, organises the largest annual Global PR Summit and presents yearly Global Awards recognising PR achievement. Founded in 1997, the PR Museum is considered the world’s largest collection of materials documenting PR history. Among the organization’s possessions are more than 600 significant books, including many signed first editions, along with myriad artifacts, correspondence and photographs of historically significant industry people and events. Displays and exhibits include examples of old media technologies, a digital archive of videotaped interviews with influential leaders such as Daniel Edelman, Harold Burson and David Finn, and other artifacts that chronicle the evolution of the field of public relations. The inspiration for the Museum is another great historical figure—industry pioneer Edward Bernays, widely recognized as the “father of public relations.” In 1919, Bernays opened one of the first offices as Public Relations Counselor in New York, and later taught the first PR course at New York University in 1923, and publishing the first groundbreaking book on PR, Crystallizing Public Relations, that same year. Visitors have access to dozens of books—many of them from Bernays’ own library—covering such subjects as psychology, social psychology, news media and political history. Authors include such well-regarded thinkers as Walter Lippman, Gustave LeBon, Everett Martin and Alfred Trotter.